Saudi Arabia proposed a humanitarian truce with the Houthis in Yemen who they have been battering with airstrikes for more than a month, killing hundreds of people. This comes days after the Shia rebels started shelling the Saudi border. "The actual date will be announced shortly as well as the requirements," Saudi Foreign Minister Adel al-Jubeir said in a news conference on Thursday, adding: "This is all based on the Houthis complying with the ceasefire." Saudi Arabia and its Sunni allies have been conducting a military operation against anti-government Shia Houthi rebels in Yemen since late March, launching airstrikes and establishing a naval blockade of the country. Overall, since the start of the operation about 1,250 people have died and over 5,000 have been wounded, according to the World Health Organization. Local estimates are much higher than that. The humanitarian situation in Yemen is increasingly dire, the fighting and the blockade causing shortages of food and fuel, destruction of infrastructure and displacement and deaths of civilians. The UN has been calling for a pause in the conflict to deliver humanitarian supplies. The call for a truce comes days after the Houthis started shelling Saudi towns on the border with Yemen, prompting new waves of airstrikes. Some of the fiercest fighting between the rebels and the forces loyal to Yemen's Saudi-backed government is concentrated in the key port city of Aden, home to some 800,000 people. Iran and Russia have been calling for an end to hostilities and a political solution since the conflict began . Tehran's peace plan was rejected by the Yemeni government. Last week, the UN Security Council failed to back Russia’s appeal for an immediate ceasefire or humanitarian pauses in war-torn Yemen, with Russia’s UN Ambassador Vitaly Churkin saying that fellow envoys were showing "amazing indecision" in the face of the worsening humanitarian crisis there. Even as the Saudi Foreign Minister voiced his proposal for a ceasefire, a key Saudi military commander promised to deliver a "harsh response" to the Houthis regardless of any limitations. In a statement broadcast on live TV, Brigadier General Ahmed Asseri said: "The equation has now changed. The operation had been aimed at protecting the legitimacy in Yemen and the Yemeni people. The confrontation is now targeting the border of the Kingdom of Saudi Arabia and the safety and security of Saudi cities. Coalition forces will deliver a harsh response starting this moment, so that those who carried out this operation will pay the price," he added. Shia Houthi rebels took control of Yemen's capital Sanaa in September 2014, forcing Sunni President Abd-Rabbu Mansour Hadi to flee to Saudi Arabia. 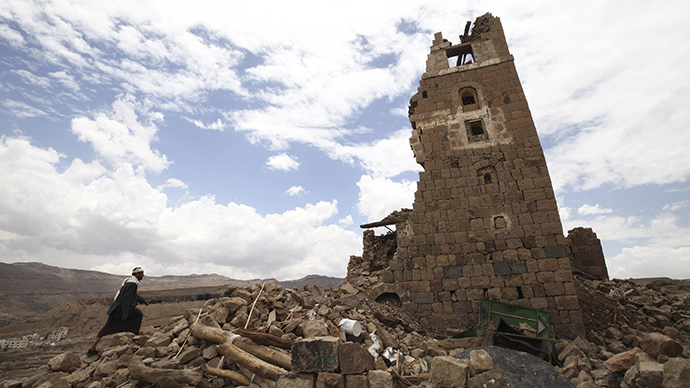 The Yemeni government has reportedly called on the UN to start a ground intervention against the Houthis. However, speaking on Thursday, both US and Saudi top diplomats said neither country was considering putting boots on the ground.